We had a delightful visit to The School of the Future in New York City the other day. Lots of engaged kids, a great blend of instruction and constructivist work, and an obvious intellectual culture. And as the picture illustrates, everywhere we went we also saw helpful visual reminders of the big ideas and essential questions framing the work we were watching: School of the Future staff have long been users of UbD tools and ideas. Let’s start with a simple example from my own teaching. The EQ for the unit: Who sees and who is blind? The readings: The Emperor’s New Clothes, Plato’s Allegory of the Cave, Oedipus the King. Students are instructed to take notes around the EQ and other questions that arise related to it (e.g. Why do people deceive themselves?). We alternate between small-group discussions of the previous night’s reading, Socratic Seminar on the readings with the whole class, some mini-lessons on reading and note-taking skills, and a teacher-led de-briefing of what worked, what didn’t in Seminar as well as a discussion of confusing points in the texts. The final assessment? An essay on the EQ. At every turn, in other words, the EQ looms large in the unit. 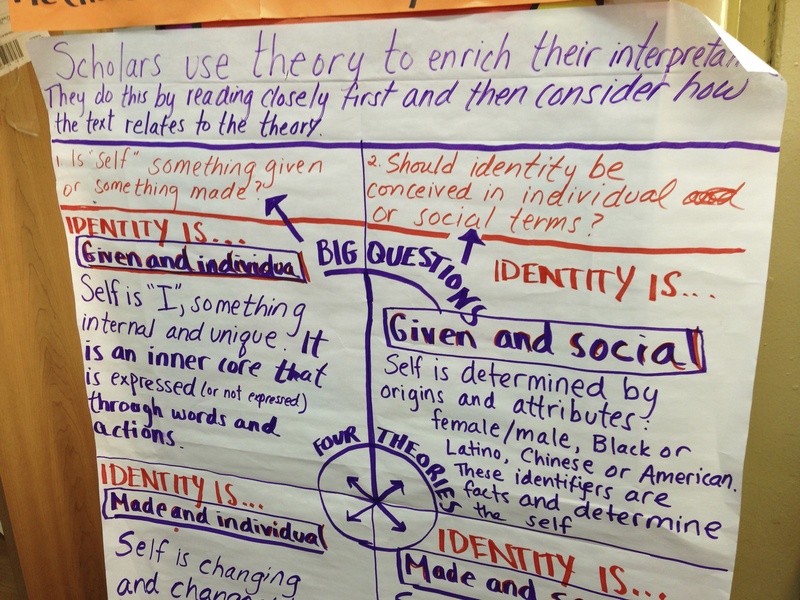 Students are not only encouraged to keep pondering it across each reading, but they take notes on the question and routinely remind one another that this question is the focus. This is far different than what we typically see in walk-throughs where EQs are being used. The only person that keeps referring to the EQ is the teacher; the main use of the question is by teachers in which they point out “answers” to the EQ. Rarely is the EQ central to the assessment – in part, because all too often the EQ is too convergent and has a right answer that the teacher wants learned. Almost never does there appear to be a plan whereby the question goes from the teacher’s control to the students’ control. All well and good in English, Grant; what about math? Do you know a related problem? Have you seen the problem before? Could you restate the problem? Can you check the result? Can you derive the answer differently? Can you use the result, or the method, for some other problem? Let me remind you of a basic point, then: in UbD we list Essential Questions in STAGE 1. In other words, the EQ is a goal. i.e. the QUESTIONING is the goal: the box does not say Essential Answers to Nice Questions. Introduce a question designed to cause inquiry. Ensure that the EQ is thought-provoking, relevant to both students and the current unit/course content, and explorable via a text/research project/lab/problem/issue/simulation in which the question comes to life. Elicit varied responses and question those responses. Use questioning techniques and protocols as necessary to elicit the widest possible array of different plausible, yet imperfect answers to the question. Also, probe the original question in light of the different takes on it that are implied in the varied student answers and due to inherent ambiguity in the words of the question. Bring new text/data/phenomena to the inquiry, designed to deliberately extend inquiry and/or call into question tentative conclusions reached thus far. Elicit and compare new answers to previous answers, looking for possible connections and inconsistencies to probe. Ask students to generalize their findings, new insights, and remaining (and/or newly raised) questions about both content and process. Note that this process is not restricted to a single unit. We can use this framework to string different units together so that Phase 3 could be the start of a new unit in which a novel perspective is introduced and explored using the same question(s). Let’s see how the framework helps us more clearly see an alternative approach in which the Essential Question becomes more prominent throughout the course. What is science? How does it relate to or differ from common sense and religious views on empirical issues? 2.Elicit varied responses and question those responses. Students read 3 different short readings that address the EQ, in which there is great disagreement about what science is, how it works, and how much stock we should put in its answers. 3.Introduce and explore new perspective(s) Students are asked to do 2 different experiments in which methods vary and margin of error is salient. They also read about a few controversies and false discoveries in the history of science,: read Karl Popper on how science is inherently testable and tentative – “falsifiable” – where by contrast ideology can always ‘explain’ anything; read Feynmann on how most people misunderstand what science is; read Hume on why we should be inherently skeptical about science as truth. 4.Reach tentative closure. Ask students to generalize their findings, new insights, and remaining (or newly raised) questions about the nature of science. As the example suggests, proper treatment of the question would demand not only that the question be constantly revisited throughout the year – “Based on the previous two experiments and our lively disagreements about the findings in the Global Warming research, what would you now say science is?” – but that the course must also therefore include a look at pseudo-science and the danger of confirmation bias, as well as consideration of the very counter-intuitive aspects of modern scientific thinking (which often give rise to common and persistent student misconceptions in the sciences and about science itself). Introduce a question designed to cause inquiry. After a cursory lesson on the typical names and characteristics of US regions, ask: Could we carve up the map differently? What kinds of regions might be just as useful for us to define? What “regions” do we live in? How many regions do we live in? Elicit varied responses and question those responses. To what extent is defining an area as a “region” useful? Compare and contrast the benefits and weaknesses of various regional maps and categories for school, town, and state; and alternate regions of the US, based on cultural aspects (e.g. regional sports affiliations). Introduce and explore new perspective(s) Pursue the idea of regions based on cultural aspects (food, leisure, jobs) and thus the extent to which talking about regions like the “south” or “northwest” may be unhelpful because it can cause us to stereotype and overlook uniqueness or diversity in every region. Related questions can then be explored: To what extent do we usefully define ourselves in “regional” terms, e.g. southerner, coastal, West Tennessee, Upstate NY, Northern California, etc. as opposed to by state or nation? When is it useful to define region by physical characteristics and when is it useful to define it by sociological characteristics? etc. Reach tentative closure. Ask students to generalize their findings, new insights, and remaining (or are newly raised) questions about regions and the usefulness of the idea. In other words, inquiry by design, not mere teacher rhetorical questioning, makes an EQ come to life and go into depth. The texts, prompts, rules of engagement, and final assessments provide the key elements needed for the design to succeed, in light of the just-noted criteria: an intriguing and key question, inherent ambiguity, clearly different points of view, and shades of gray that will require careful questioning and discerning observation and research. 1) is open-ended; i.e., it typically will not have a single, final, and correct answer. 2) is thought-provoking and intellectually engaging, meant to spark discussion and debate. 3) calls for high-order thinking, such as analysis, inference, evaluation, prediction. It cannot be effectively answered by recall alone. 4) points toward important, transferable ideas within (and sometimes across) disciplines. 5) raises additional questions and sparks further inquiry. 6) requires support and justification, not just an answer. 7) recurs over time; i.e., the question can and should be re-visited again and again. Questions that meet all or most of these criteria qualify as “essential.” These are questions that are not answerable with finality in a single lesson or brief sentence – and that’s the point. Their aim is to stimulate thought, to provoke inquiry, and to spark more questions, including thoughtful student questions, not just pat answers. They are provocative and generative. By tackling such questions, learners are engaged in “uncovering” the depth and richness of a topic that might otherwise be obscured by simply “covering” it. POSTSCRIPT: as I promised in a reply to a post here are some elementary units in the UbD Template: Elem Units from UbD Guide to Unit Design. I appreciate that your examples in this post cross grade levels and subjects. The criteria of an EQ listed is fantastic! The parts that I think will have the most impact on the teachers I support is that EQs don’t have a single correct answer (that helps us tease out “open ended”) and that they require justification. This synthesizes so many of the moving parts educators are grappling with daily. Thank you! Thanks for the revised EQs – I agree with your focus on the outcome of sustained and meaningful inquiry (by their fruits we shall know good teaching). Probably we just need a better substitute phrase? i teach at SOF and can testify to the power of your contribution to our work – which has infused much of what we do for my entire time here. the momentum and logical clarity of your “4 phase sequence” serves as a good example. your criteria for a good essential question used to be more popular in SOF classrooms. i remember one where the EQ for the year supposedly centered around “What is Justice?” – pretty equivalent to your example of “What is science?” since those days we’ve made refinements in attempting to focus on questions that might be less “essential” to Plato and more essential to our students. (btw – hard not to laugh when people use the phrase “socratic seminar”). i believe for many of my colleagues a question like, “What dynamic combination of internal and external factors led to the transformative but limited success of the Civil Rights Movement 1954-1968?” better sparks student curiosity, engagement with significant content, and meaningful construction of conceptual frameworks than the previous focus on a receding mirage of a particular “essence”. Thanks for your comment. I am not saying that an essential question has to be as broad and philosophical as What is Justice? Certainly, in history, science, and math the questions may be as tightly focused as your example (though your example seems AWFULLY complex a phrasing to my old ear; see below). The form or format of the question is of course not what matters. As we have said for years the only thing that matters is whether the question yields the desired result: interested and sustained inquiry, on matters of substance. But don’t dismiss the power of an ‘essence’ question, especially for revisiting material from another new perspective repeatedly through the course, e.g. Who is an American? Says who? How transformative was the Civil Rights Movement? To what extent did the Civil Rights Movement achieve its goals? The Civil Rights Movement: why then? How vital to the Civil Rights Movement was white involvement? PS: I don’t like the phrase socratic seminar either, but it’s become too common to avoid. Socrates was often far too meddlesome in the conversations – a point ironically brought home by Mortimer Adler in his demo seminars where he completely over-dominated as facilitator. (I’m a St. John’s College grad. so I know the real deal about student-led seminars, and I taught that way. Adler was viewed with much scorn at StJ and his annual Friday night lecture became a hoot because there was always a prank). Great point. Synthesize the good stuff within a larger context. Grant…your posts are always thoughtful and right on. Do you have any sample elem units with the EQ and/or big ideas? You’ll find lots of sample units including good elem. ones as part of the digital downloads that come with the last 2 books on Unit Design from ASCD. But I’ll attach a few at the bottom of the post as a PS. I can’t seem to find the PS you indicate in this post that will provide us with sample elementary units. OOPS! I never followed through. Thanks for the reminder. You’ll see it now, at the bottom of the post. I have indeed seen the PYP and mYP planners. Our UbD template played a small role in their work. I would imagine you have seen many examples of essential questions for high school math units. What % of the time would you estimate that simply using Polya’s list instead would be an improvement? Do you think math teachers would like to see students more frequently asking themselves the questions on Polyas list, but are just not explicit enough in emphasizing that type of thinking, and not consistent enough in providing tasks that require that type of thinking? I would put myself in that boat. Most math EQs aren’t worth much; most aren’t even essential, e.g. What is a linear relationship? is surprinsingly common. I’d go with Polya in a heartbeat. But I think the key is that there are not enough truly puzzling and unscaffolded problems given to kids – without which Polya’s questions are moot. But if the questions are not modeled, then required, in a gradual-release-of-responsibility model, then students will do no better internalizing them and drawing pro-actively from them than they now do when teachers over-prompt in the use of reading strategies or coaches do in barking out orders from the sideline. The issue of autonomy is arguably the most important overlooked goal in all of education – true in the finest schools and colleges as well as average and poor schools. We conflate difficulty of content with demanding intellectual challenges; even teachers in high-level classes over-direct student learning for too long. I am going to make intellectual autonomy the next post topic. We notice the same problem with “driving questions” in project-based learning. Teachers will announce the DQ at the beginning of the project, maybe put it up on the wall, and that’s it. It becomes more like a theme, and it lives only in the teacher’s head rather than being something students actually work with and have to answer. btw, I’m sure you’re well aware of this and maybe it’ll be in your book, but a pet peeve of mine is the common misuse of the term Essential Question these days. Many people think it means simply, “a question that is important or that must be asked” or “it is essential that we ask this.” Not what Ted Sizer, you & Jay mean! BTW, I gave it the name ‘essential questions’ to reflect the Essential Schools mantra of student as worker, teacher as coach – and because it was a sort-of pun. Ted liked it, so off we went with it. Amusingly, I heard a group of teachers at a CES conference years later arguing about EQs as being in the 9 core principles of CES (which, of course, it’s not, since those principles were written before I came on board, as the project started). In light of your good comment, I added the ‘official’ definition from the new book at the end of the article. Hooray!! This is what education needs!!!! Now!!! I wish my kids had this in all their classrooms. But, alas, they must practice bubbling in on scantron sheets, answer 5 multiple choice questions on FCAT reading samples, writing a formulaic 5 paragraph essay (FCAT style), and rush through because there is no time for actual learning. High stakes testing leaves no space for this type of teaching. It’s a very sad reality. I hope some legislators get wind of your book. It sounds amazing! Why do so many HS history teachers lecture so much? 5 unfortunate misunderstandings that almost all educators have about Bloom’s Taxonomy. Teaching Kids About Online Political Engagement Works. Should We Do It More? Helping kids understand and engage in politics online makes them more likely to keep doing it. But is that a good thing? Two Pennsylvania moms had kids who were struggling readers; now they're advocating for their district to overhaul its entire approach to literacy. Arizona is one of seven states where teachers are prohibited from portraying homosexuality in a positive way. Young Parkland residents had much higher rates of having their ballots go uncounted or rejected than did young people in other parts of Florida. A Massachusetts lawsuit seeks to remove specific texts from a district's curriculum on the Middle East, and singles out individual teachers. Hundreds of students protested by the U.S. Capitol as part of an international movement to demand policies to curb climate change.